When Sri Lanka’s premier telecommunication connectivity provider needed to ensure its new internet data centre operated reliably and securely, Invertek’s Optidrive Eco variable frequency drives were able to provide the perfect solution. The company, which provides a mobile telephone network for more than 11million subscribers, needed to ensure that the temperature control system on the data centre’s central air conditioning system was both reliable and efficient to operate. Anushka Chandrasoma from Hayleys Industrial Solutions Pvt. Ltd., Invertek’s sales partner in Sri Lanka, explains: “This internet data centre became the first commercial one in the country to gain Tier III Design Certification and has been built to meet constant demand for a high-level of reliability and security, especially for mission critical applications by government and global enterprise customers. “Sri Lanka’s largest Satellite Earth Station and a Network Monitoring Centre supporting the broadcast of more than 130 international and local TV channels to over 900,000 subscribers across the country are also co-located at the centre. “With such important customers, as well as so many viewers relying on being able to watch their favourite programmes, it is essential that all applications serving the data centre work as reliably as possible without any harmonic distortions that could cause damage to the equipment housed there. “This is a respected company and last year alone won two SLIM Nielsen Peoples Awards for Telecoms Service, and wishes to retain this position as a valued provider of telecommunication services which is why every part of the operation needs to run as smoothly as possible. “We were asked to advise on the best variable frequency drives for this application which uses chilled water pumps to operate the crucial air conditioning. “Operating expensive IT computer equipment for extended periods of time at high temperatures greatly reduces reliability, longevity of components and will likely cause unplanned downtime which is why air conditioning is critical in such centres. “We suggested installing the Optidrive Eco 18.5kW IP55 and the fact we can offer variable frequency drives with these ratings means that are ideally suited for such applications as they offer improved protection against any water ingress.” he added. Following installation of the Optidrive Eco variable frequency drives a harmonic audit has been carried out using a power quality analyser. 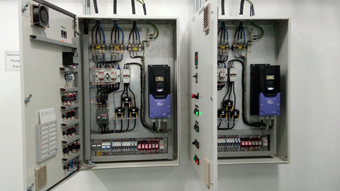 Dylan Davies, Invertek’s Product Manager, said: “This installation used our popular Optidrive Eco variable frequency drives which have been designed to provide maximum operating efficiency while minimizing environmental impact. “By providing efficient, reliable and quiet control of motors for pumping applications, the Optidrive Eco was ideal for use here and the accurate speed control and lower energy consumption means the company will soon see payback for the cost of the drives and their installation,” he added.